The Wicking Dementia Research and Education Centre has taken out a major award for its ‘Understanding Dementia’ and ‘Preventing Dementia’ Massive Open Online Courses (MOOCs), at the prestigious Tasmanian Export Awards. The Centre received top accolades in the ‘Health & Biotechnology’ category for the free, online courses which to date have attracted over 220,000 participants globally from 185 different countries. 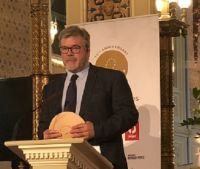 Wicking Centre Director James Vickers said the award highlighted the far- reaching impact the Centre’s unique education model was having on a rapidly increasing global health issue. “This recognition by Austrade and the Tasmanian State Government is important for our Centre as it highlights what can be achieved by a dedicated group of people addressing a large scale, global public health priority,” Professor Vickers said. Professor Vickers said delivering dementia education through short courses that are high quality and entirely online had removed access barriers to regional, remote and rural communities globally with participants engaging in the course from places including Nigeria, Chile, Namibia, China, Botswana and Nepal. “Research through these courses enable unique multinational studies with thousands of participants, providing important insights into the impact of dementia across the world and opens up new collaborations with leading international universities,” he said. Now in its 25th year, the Tasmanian Export Awards recognise export excellence by Tasmanian enterprises and the important contribution that Tasmanian businesses make to the local economy through job creation and increased prosperity in the community. Wicking Dementia Centre Advisory Board Chair and former Tasmanian Premier David Bartlett also congratulated the Wicking team on the award. “As a global leader in dementia research and education programs the Wicking Dementia Research and Education Centre is making a significant impact in improving the quality of life for people touched by dementia,” he said. The Wicking Centre will now progress as a national finalist to the Australian Export Awards to be held in Canberra, on 27 November. The Wicking Dementia Research and Education Centre is part of the University of Tasmania’s College of Health and Medicine.